Ten years ago, most Americans believed Saddam Hussein had WMDs. Today, most Americans believe Iran has nuclear weapons. And once again, Big Lie propagandists like Erin Burnett are (mis)leading us into war. Note that CNN uploaded this video to YouTube on February 15th with the white-on-red “LIVE” text overlay intact. It wasn’t “live” then, it wasn’t “live” any of the other countless times they’ve aired it since then, and it wasn’t “live” on March 2nd when la femme fasciste Erin Burnett had it looping in background as she beat her incessant Iran War drum on the Friday evening edition of “OutFront”. 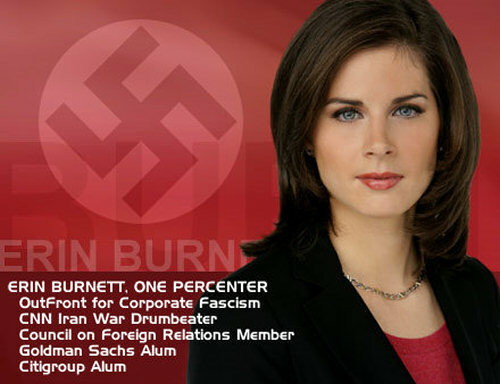 Erin Burnett is a One Percenter. Should we be surprised that delivering their message is her mission? We sometimes use links shortened with http://tinyurl.com to so they don’t break in emails. If you actually think we would use them to cloak phishing or malware, open them with this: http://longurl.org. We also want to thank the website designs mobile, website designers mobile and website developers mobile who support our efforts.